Yesterday, I was doing my usual blog hopping and promoting my contest Aeirin’s Collections EC FEED ME GIVEAWAYS, I discover a new blog. This blog is different from most of the blogs. 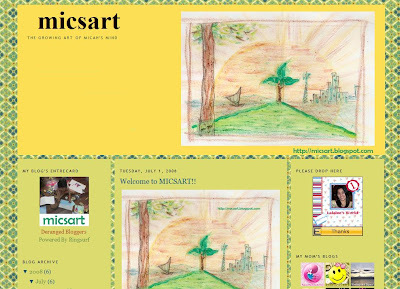 It is called “MICSART – the growing art of micah’s mind”. It’s a blog of an 8 year old child named Micah. 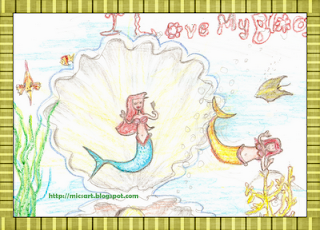 At a very young age, Micah shows her artistic side and love for blogging. Does the name Micah ring a bell? No doubt, because she’s the daughter of Mommy Ruby, the founder of Pinay Mommies Community. Now, we all know where she got her passion in blogging. Micah wants to have her own blog, but since she doesn’t know how to write her mind-out. Her mom suggested Micah to use her drawings to express herself. Here’s one of Micah’s work. This is awesome, right? Want to see more of Micah’s drawing? Click here to visit her blog.